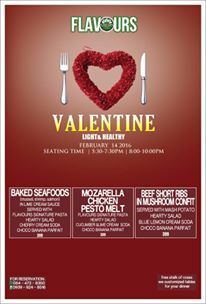 Enjoy a healthy and light dining experience this Valentine’s Day. Choose from 3 delectable dishes – that’s seafood, chicken, or beef – for your main entree. This is served with salad, pasta, a healthy soda drink, and even dessert. And that’s only PhP 399.00 per plate! Guests may request a customized setting for their table – and this great service is actually free for advance bookings! So book in advance for the best experience. Every couple that dines here will also get a free stalk of rose.